Madness in Solidar: The Ninth Novel in the Bestselling Imager Portfolio (The Imager Portfolio Book 9) by L. E. Modesitt Jr.
Four centuries after its founding, Solidar's Collegium of Imagers is in decline, the exploits of its founder, the legendary Quaeryt, largely forgotten. The Collegium is so lacking in leadership that the dying Maitre must summon Alastar, an obscure but talented senior imager from Westisle far to the south who has little knowledge of politics in the capital, as his successor. When Alastar arrives in L'Excelsis and becomes the new Maitre, he finds disarray and lack of discipline within the Collegium, and the ruler of Solidar so hated by the High Holders that they openly refer to him as being mad. To make matters worse, neither Rex Ryen, ridiculed as Rex Dafou, nor the High Holders have any respect for the Collegium, and Alastar finds himself in the middle of a power struggle, with Ryen demanding that the Collegium remove the strongest High Holders and the military leadership in turn plotting to topple Ryen and destroy the Collegium. At the same time, Ryen is demanding the High Holders pay a massive increase in taxes while he initiates a grandiose building project. And all that, Alastar discovers, is only a fraction of the problems he and the Collegium face. 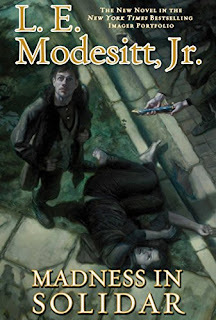 L. E. Modesitt Jr. is without doubt one of my favourite authors, I have read many, not all admittedly, but many of his works and although, if you are familiar with his books, they are all mostly rather formulaic in structure and plot, but it is a formula that I can never get bored off. It's a formula that is the reason why I first began my love of fantasy - the hero against all odds, uses wit, power and courage to triumph against evil, oh and gets the girl in the end. Madness in Solidar follows in the same captivating structure and follows Alastar, who becomes the new leader of the Collegium of Imagers (the ability to create items by focusing their imagination and willpower) at a point where the Collegium is a mess and on the verge of ruin, and more importantly so is the kingdom. Alastar is tasked by the kingdoms ruler, Rex Ryen, to convince the High Council of Holders (land owners) and the factors (traders) to a tariff increase, so effectively an increase in tax. Alastar is unfortunately in the unenviable position of dealing with the abject state of the Collegium he was inherited with, the arrogance and greed of the High Holders and Factors, and the erratic, approaching on the crazed behaviour of the ruler Rex Ryen. In short, it's a frothing cauldron, on the precipice disaster. For those who have never read his works, L E Modesitt has a rather unique writing style, and if I had a single word to describe it, it would be - mature. Not to say boring, but Modesitt stories are never simple, but weaved from layers of intrigue, mystery and complexity. There is also a moral learning lesson behind his words. His main character's are always thought provoking and intelligent, and Alastar is not different in that sense but he is slightly older than Modesitt's other books. The advantage of that is that Alastar is not second guessing himself or his powers and is confident in who he is and what he can do. I liked Alastar's character, particularly the cold ruthlessness he demonstrated once all avenues were closed off. I really enjoyed this book and I should add it is not necessary to have read the other Imager books in order to follow the story, as it can stand on its own, but it may broaden your reading experience if you have read the previous books as there some subtle hints that are alluded to in it. In summary this book is a must for any Modesitt fans and those who enjoy rich fantasy told in a sophisticated style then give this book a try.